A full moon will light up the heavens on Christmas Day this year, for the first time in more than 30 years. Holiday lights will adorn many neighborhoods this Christmas, but look out for a very special lighting treat in the form of a full moon this Friday. 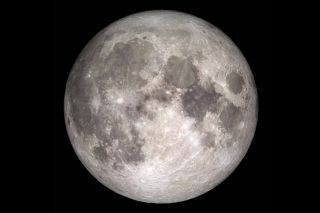 This month, the full moon will peak at 6:11 a.m. EST (1111 GMT) on Dec. 25. This will be the first time a full moon has graced the skies on Christmas Day in 34 years, and it won't happen again until 2034. Shop all of our most popular lunar products today! Earth's closest neighbor is thought to have formed when a Mars-size rock collided with Earth, stripping off the outer layers. Since then, the moon has continued to affect the tides on Earth. "As we look at the moon on such an occasion, it's worth remembering that the moon is more than just a celestial neighbor," John Keller, of NASA's Goddard Space Flight Center in Greenbelt, Maryland, said in a statement from the space agency. "The geologic history of the moon and Earth are intimately tied together, such that the Earth would be a dramatically different planet without the moon." The online Slooh Community Observatory will host a free webcast of the Christmas full moon, and Comet Catalina, on Christmas Eve (Dec. 24) at 7 p.m. EST (0000 GMT). You can go to Slooh.com to join and watch the broadcast, which will run until midnight EST, and also see Slooh's library of past shows. You can also watch the broadcast here on Space.com, courtesy of Slooh. Editor's note: If you capture an amazing photo of the moon or Comet Catalina that you'd like to share with Space.com and our news partners for a story or gallery, send images and comments in to managing editor Tariq Malik at: spacephotos@space.com.